Döner kebabs are a Turkish specialty, usually made of lamb, and cooked on a spit. According to Wikipedia “Döner kebabs are not very popular in Hungary,” which of course is one more in millions of reasons to never EVER trust Wikipedia. 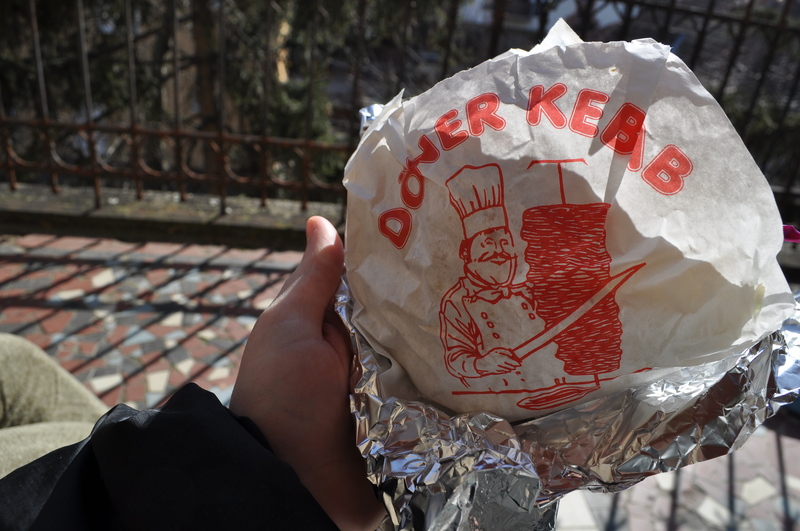 In fact, Döner kebabs are very, very popular in Hungary. In Budapest, the kebabs are made and served by Turkish immigrants. They know how to grill meat and make bread and, trust me on this, do unspeakable dessert-related things with filo dough and honey. 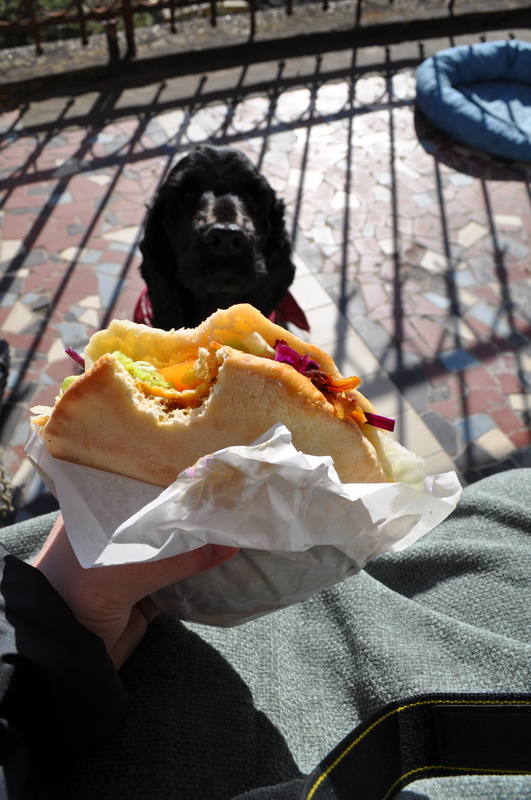 Because it is inexplicably and cruelly snowing today, I had to recall last Friday, when Gyorgyi and I enjoyed a delicious Döner kebab in a pita on our sun-coated deck. There is a fantastic kebab joint on Oskola utca. They don’t have a website. The shop doesn’t even show up on Google Maps. But you’ll know you’re in the right place when you see the long line, which is virtually unheard of in any restaurant in Hungary. They have a line because the food is great. 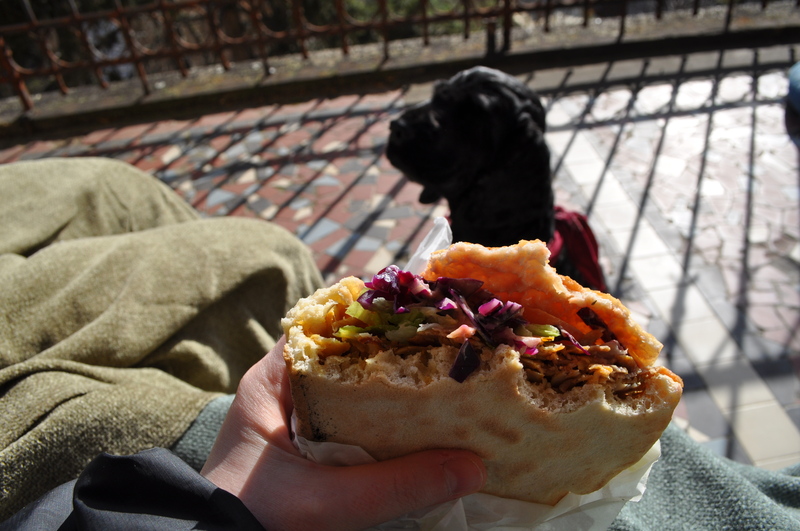 They serve about five things: Döner kebabs (lamb or chicken) in a pita, wrap or plate. The kebabs are served with tomatoes, lettuce, onions, purple cabbage and optional yogurt and spicy paprika sauce. They also have turkish-style pizza and a pita with grilled veggies. Oo, tapas. Now I’m jealous. I was in Spain twice last year. Once in crummy weather and once in great weather. So many tasty places! But on the topic of kebabs, if you’re going to be in Budapest, you should try Szeráj Török Étterem. It’s basically right in the center of town (Szent István körút 13) to be exact. They make a great ones!